The function of a regional publishing team isn’t just about amplifying the signal on what our colleagues in Riot HQ have built. We may not design new League champions or game play systems here in Dublin but we still create experiences that dramatically alter how players interact with the game. Annual in-game events such as Pool Party or Lunar Revel may be primarily developed out of Riot’s Central office in Los Angeles, but regional offices have the freedom to build their own from the ground up. Our EU Publishing team based in Dublin started experimenting in this space in spring of 2017 when we launched our Slumber Party event for players on EUW and EUNE. Since we released a number of skins involving a “onesies” pyjama theme, it was a natural fit to invite players to meet up with their friends for a late-night gaming session, play games with these champs, and earn points toward loot rewards. Eager to build on what we learned when creating Slumber Party, we created the concept for ARAM-arama—an event designed around the... wait for it... ARAM game mode. Much of our Publishing focus in 2018 was directed toward the more competitive segment of our player base (Ranked system upgrades, Clash, etc.). We knew there was a devoted group of players who preferred ARAM and we wanted to show them some love. ARAM had recently received some quality-of-life updates, making it a good time to highlight the mode. We felt like ARAM had acquired the undeserved reputation for being a casual mode that requires no skill. We wanted to highlight tips from an ARAM veteran (over 4000 games played) to showcase the strategic complexity that can go into becoming an ARAM god. Even though we never want to suggest that there’s a right way to enjoy League of Legends, we know the competition of Ranked can be stressful and we feel that by encouraging players to unwind with some lower-stakes battle on the Howling Abyss from time to time might offer a way of avoiding risk of burnout. 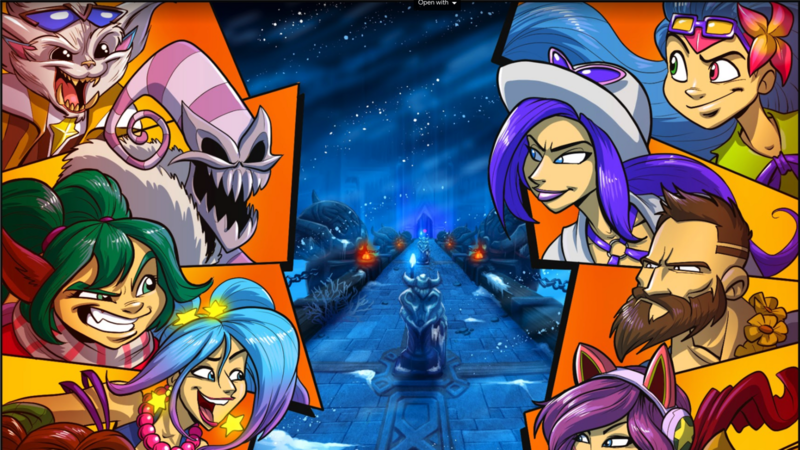 At the time of Slumber Party’s launch in 2017, League had no built-in mission functionality, which forced us to calculate points through a clumsy workaround solution involving a custom database, which created delays in awarding the event rewards. 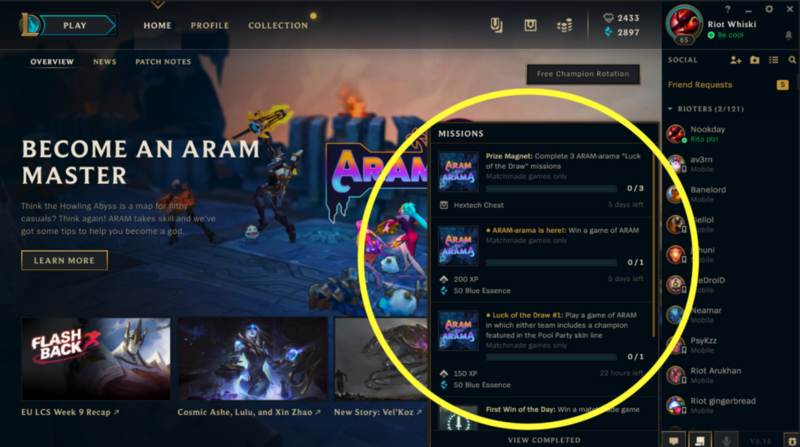 By collaborating with our Missions team in the Central office, we were able to create custom missions for ARAM-arama, a first for any EU-exclusive event. In the player survey we conducted after the event wrapped, 66% stated that mission rewards were their primary reason for taking part. By handling the distribution of rewards through missions, we were able to streamline the process of registering participation in the event. Instead of needing to go to a separate website to click an “Enroll” button (the process for the Slumber Party), they could directly join in the client with minimal fuss. The distribution of rewards promptly at the conclusion of each mission also reduced the lag players experienced during Slumber Party, waiting several days after the conclusion of the event for us to tally points and figure out which accounts to award. As an EU Publishing team we think there’s still plenty of room to improve, which was reflected in the great feedback from players. Some asked for more challenging ARAM missions, proving that just because certain players prefer the Howling Abyss doesn’t mean they’re necessarily casual or non-competitive. We also heard that they wanted to see some kind of customisation to the Howling Abyss itself rather than just a thematic overlay existing outside the game. Whether or not we can feasibly deliver on something like map customisations, it’s exciting to realise there are many ways to boost the quality of the experience next time we run a regional event for European players. We’ve only gotten started!